How do I make my bathroom pipes more practical? I need to install a new vanity in my bathroom but I'm not sure what to do about the plumbing for under the sink. I believe the present location of the sink was originally where the bathtub was. The pipes for the faucet come out of the floor behind the sink on one wall. The drain pipe goes through another wall (on the left side) and also through the floor. It is awkward and takes up a ridiculous amount of space and is making it difficult to choose a vanity. Would you be able to tell me what would need to be done to fix this problem? Is it a simple fix or is it something major? I would appreciate any advice or suggestions. The relatively fixed elements are the drain pipe going trough the floor and the vent pipe running to the left. It is complex to change where these exit the room (go into the wall or floor). As other comments and answers suggest, you can probably shift these pipes toward the back of the vanity. 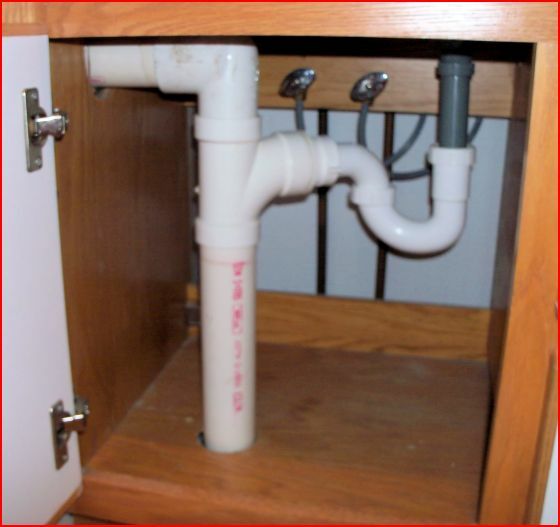 With the vanity removed, you can put in a "sweep elbow" (a shallow curve rather than a sharp 90 degree) from the pipe coming up through the floor toward the back of the cabinet area. You can then turn it upward, again with a sweep elbow, and join the P-trap to that upright pipe. If the sweep elbow is higher than the floor of the vanity, you can open up the floor to lower it or you can take out a channel in the vanity floor to accomodate. This should still leave enough room higher up to accomodate drawers on one side ot the other. The vent stack can also be turned toward the back to meet the newly routed drain stack. Elbows in vents are less critical than waste elbows. With the vanity out you can reconfigure these pipes in the wall. the one going up probably attaches to a vent, the other goes down and away. moving them into the same wall as the supplies will be less easy. How do I install this wall mount bathroom sink? Does my vanity's sink need to be offset from the bottom-exit drain pipe?